Sean McDermott is playing consistent top-flight football but there’s been no call from Martin O’Neill yet. “Packie Bonner, Shay Given…maybe I can be the next one?” Sean McDermott wonders. But it’s been a while since he was involved with the international setup. Over four years at this stage. He started an Under-21 Euro qualifier against Montenegro in Tallaght Stadium in March 2014 alongside the likes of Shane Duffy, John Egan, Matt Doherty and Jeff Hendrick. All have since sampled life in the senior ranks. Even the replacement goalkeeper that night – Aaron McCarey – has been called up by both Giovanni Trapattoni and Martin O’Neill. But McDermott’s situation is a little unusual. He plays his club football in Norway, the country of his birth and where he’s grown up. He’s first-choice for Kristiansund, who were promoted to the Eliteserien last year, which means regular top-flight minutes for the 24-year-old. But, still no call from O’Neill. Last week, the Irish boss named six goalkeepers in his provisional squad for the upcoming summer friendlies against Celtic, France and United States. Three of them ply their trades in the third tier of English football. Is McDermott at a disadvantage just because of geography? “That’s a hard question for me to answer,” he says. With a Norwegian mother, McDermott has options regarding senior international football. But having represented Ireland from Under-15 right through to Under-21, he admits it would be strange to veer from that path. “I haven’t been picked for either Ireland or Norway yet so I just have to wait and see,” he says. McDermott’s eyes are firmly on the prize. He could easily grow frustrated at the lack of opportunity with the Irish side so far. Instead, he’s got a steely focus. “Mentally, I think goalkeeper is the toughest position,” he says. McDermott is happy in Kristiansund, and enjoying being back in the top division. Having been at Arsenal for three years as a teenager, he returned to Norway and signed with Sandnes Ulf. 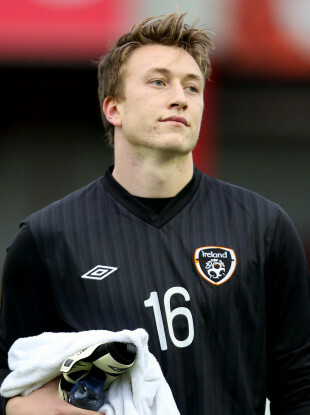 And at 19, he was a first-choice goalkeeper in the country’s top-flight. But, things changed when Icelandic number one Hannes Halldorsson arrived and McDermott began to struggle for game-time. A move to Start didn’t work out but he subsequently dropped down a division and rediscovered his form at Ull/Kisa. Last year, Kristiansund had just been promoted and swiftly made their move for McDermott. The club’s first ever season in the top division went well. Relegation was never a concern and they comfortably finished in mid-table. “It’s going very well since I came here,” McDermott says. McDermott was lauded for his performances with Kristiansund last year but feels he's playing even better right now. There’s a cerebral quality to the way McDermott talks about learning and development. Like most goalkeepers, he’s a different kind of interviewee: reflective, introspective, eloquent and, most of all, interesting. “When I watch games today, I’m like a computer,” he says. McDermott progressed to the Arsenal reserves but was never called up to Arsene Wenger’s senior side. Still, he has only positive memories of his time in north London. “Growing up in Norway, you always watch the Premier League,” he says. As our conversation develops, McDermott’s slight northern lilt gets more pronounced. His father, Terrence, hails from Mountcharles and the family get back there regularly. McDermott is well aware of the goalkeeping pedigree in the county and says he idolised Given as a youngster. But, nowadays, he’s very much intent on crafting his own on-field persona. “Once you grow up, you can learn something from everyone,” he says. Our chat ends the same way it began: talking about Ireland. “I always remember the first time I ever pulled on that shirt,” McDermott says. Email “'I want to be Ireland's number one - and I know they're watching me'”. Feedback on “'I want to be Ireland's number one - and I know they're watching me'”.